Words by Kevin Doocey on May 9, 2009 . How suiting it would be should Mark Viduka score the winner or at least play a major role on Monday as Newcastle face their lesser rivals in a bid to avoid relegation. Viduka hasn’t been the most consistent performer this season with very little performances but since his comeback against Tottenham, he has looked quiet decent indeed. 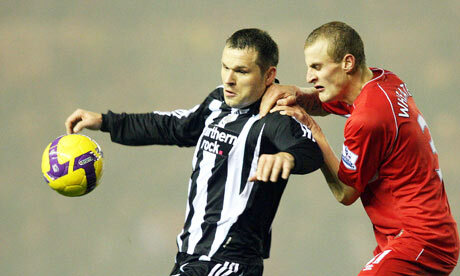 There is no doubt that Viduka can score goals as well as use his best skill, holding up play to boost Newcastle’s chances come Monday. Viduka scored in his first game against Boro last season and Shearer thinks he’s well able to do it again. ‘Big performances are going to be needed by everyone, not just Mark, but he has played for Middlesbrough, and he has scored against them. He’ll know what it means, and we’ll be looking for a big performance from him. ‘We’ve got to try to get people nearer to him when he’s actually winning headers, or when the ball’s coming into him. Shearer has said that we need to score first against Boro and how true that is, it’s been the story of the season. We have never really gone in front in many matches this season however in the ones we have, we didn’t tend to lose too many. Monday is D-Day, the day for heroes if there are any.